In terms of revenue, the NFL is the most successful league on the planet. Throughout the mid-nineties till now it has over taken just about everything out there. I am here just to say that it has reached it's peak dominance. It will always be popular, don't get me wrong. It just will not be where it is now ever again. Back in the 1980s the NFL grew really fast. So fast that in 1987 there was a player strike. You see this sort of thing in other businesses as well. When a company is doing "too well" labor problems creep in. It happened in 1987 for the NFL and it will happen again next year. In 1994 it happened to MLB, which opened the door to the NFL. In the NHL you had the opposite problem. The league stopped for an entire year back a few years ago because of loss of revenue. That, my friends, is just normal distribution of data. Meaning, sports fans were choosing to watch a disproportionate amount of NFL, therefore some other sport had to suffer. The NFL has many, many major issues to work out. Not just labor either. Injury to players is becoming more and more a problem. Last weekend there were 5 concussions in the span of about an hour. All played out on national television. In pro football it isn't something that new, just the timing of it is new. It is an extremely violent game, it's always had serious injuries we just have a bunch of newer fans with new eyes watching it. 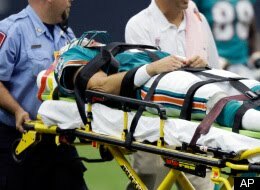 This past weekend, after stiff fines going out to players hitting too hard, we had a kinder, gentler NFL... except for a sideline ref who got run into, fell crashing down on the back of his head and was wheeled off the field with blood running down his face out of his eyes form his brain bleeding. Yes. His brain. Oh, and something more horrifying, at least to me. A player named Todd Heap for the Ravens, who was the recipient of a blow to the head two weeks ago, just collapsed on the field with no one around him this week. That video is actually being promoted by the NFL. HERE. I'm not for making tackle football; flag football. Just stating that the league that has grown at this rate is taking a dive. This stuff is now under a microscope. Speaking of dives, I've got some soccer to play.